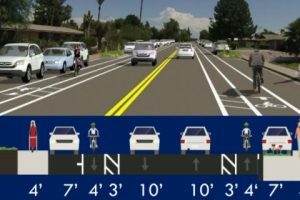 The City of Tempe is considering various treatments along Alameda Drive; one section of which, between RR tracks and Rural Road is primarily residential and currently has no bicycling-specific striping or pavement markings. When selecting please refrain from placing designated bike lanes withing the door zone of parked vehicles; in particular, Residential “Alt A” shows such treatment with the right-hand edge of the bike lane only 7 feet from the curb which places the entire width of the (very narrow, at 4′) bike lane within a hazard-zone. This places bicyclists in the uncomfortable position of needing to ride away from door zones to remain safe from door hazards and will end up riding in what is noted in the proposal as a buffer zone, which is next to a very narrow (10′) travel lane. The double-yellow dividing line will discourage motorists from providing the required 3′ minimum safe clearance (a requirement that Tempe police, by the way, do not “believe in”, see #6 here). A 7 foot parking lane is particularly silly given that the vehicle body of common SUVs and pickup trucks are nearly 7′ wide not counting mirrors; and vehicles are routinely not parked touching the curb. You may wish to consult NCHRP 766 Recommended Bicycle Lane Widths for Various Roadway Characteristics which documents that the open door width of most private passenger vehicles extends about 11 feet from the curb (and of course, vehicles can be wider still; and drivers often park their vehicles further from the curb). Bicycle facilities should be designed to keep cyclists out of this hazard zone. More information about placing Bike Lanes adjacent to parking can be found here. Perhaps no bike lane striping is indicated here? I didn’t see anything in the materials regarding volume, or crash history (I listed the crash history, below; the route as it exists is quite safe), or speed studies. There are additional remarks, below, I apologize for it being lengthy… but especially 1) concerning is the right-hook threat from heavy truck traffic in the industrial areas, and 2) the possibility that the relatively recent Broadway lane-diet has made the traffic situation worse on Alameda. With the expected construction of a bike-ped bridge over I-10 at the Alameda alignment (when? ); Alameda Dr (Tempe. In Phoenix, it continues as Roeser Road); Alameda could become a major east-west corridor for bicyclists. The current situation is particularly unpalatable; the only through routes are all very high-speed, multilaned arterial streets on which Tempe has not installed any bicycle facilities (Broadway Rd, Southern Ave, Baseline Rd), leading to a dead zone for miles when traveling E/W. The project area is neatly divided into two distinct sections: west of the RR between I-10 and the tracks is “industrial” (~ 1.3miles), and to the east of RR is residential (the current scope ends at Rural Road, ~1 mile in length). Given there is no current or planned vehicular access to cross the tracks, it naturally limits through vehicular traffic. Making this a sort of bicycle boulevard. I’m not clear on what the pre-existing on-street parking situation is here, or the currently posted speed limit is though it mainly serves some industrial and large office complexes; along with presumably very busy times when an event is occurring at Diablo stadium. The existing cross section is one lane in each direction with a continuous center turn lane. The proposed cross-section is one side with a (left) buffered bike lane. The other side of street is a separated (sometimes referred to as a “protected”) bike lane with the bike lane between parked cars and the curb. As with any separated bike lane, extra care must be taken not to obstruct motorists from being able to see bicyclists; thus parking must not be allowed where any turning opportunities exist (either at the few intersection, or the several driveways); this limits the amount of parking. Also, the width is BL in the proposal is minimal (5′ including the width of the gutter pan) — allowing for a striped 8′ parking width and and (only) a striped 3′ of passenger-side door-zone buffer. There are four different segments but generally add a standard (at least minimal) BL with an additional left buffer. Most of the segments have no on-street parking which simplifies things; and the one section with parking has enough space for the BL to be striped safely outside of any door-zone. Right-hooks are a particular deadly concern here due to the preponderance of heavy trucks in the area. Cyclists can be lulled into a false sense of security with a bike lane upon encountering a relatively slowly moving large vehicle. The existing treatment is a 48′ wide street with a continuous center turn lane leaving effectively one wide (18′) shared lane (shared between occaisional parking, vehicular and bicycle traffic) in each direction. The posted speed limit seems to be 25 (at least it is east of RR track; It may be a little higher west). Street parking is typically sporadic, and since there is a driveway for each home there are many driveways. Mill to College; ~1,500 feet. College is a major north/south bicyclist thru route given it’s proximity to ASU campus; and lack of other N/S bicycle facilities. See here for some more background on College Ave. There are claims that the Broadway lane diet which was completed in early 2016 Project has dangerously shifted vehicular traffic onto Alameda between Mill and Rural — these claims should be evaluated carefully, as to volume, speed and crashes. College to Rural; 2,600 feet. I wasn’t sure where the bulb-outs would go, but they seem fine — so long as a usable minimum BL width of 4′ is maintained; an improvement might be to incorporate a speed-table at the bulb. (usable width excludes any gutter pan or other obstruction). The strong urge to place bike lanes in the door zone should be resisted. The proposed “Alt A” is particularly bad as it places the BL entirely within the door zone (a 4′ BL adjacent to a 7′ parking area). There is a document on the project page conducted an average count of number of parked cars. 2009-2017 (nine years) of data show a total of 11 reported bike-MV crashes along this route. None were west of I-10 but this is probably expected, due to presumably very low cyclist volumes. None were reported to be serious. The few that were reported were mostly motorists turning across bicyclists in crosswalks; 9 of the 11 were at the “major” intersections — either Priest, Mill, or Rural Rd; and almost all of those were bicyclists traveling not along Alameda. Although bike lanes, and separated bike lanes more so, can prevent or mitigate sideswipe or rear-end collisions, none of the reported crashes were of this type. It is highly doubtful that any of these treatments could improve bicyclist safety; because it is already nearly completely safe… they appear to be designed to impart the feeling of safety, even though they can exacerbate common crashes urban bicyclists face. (doorings, drive-outs, right-hooks). WB bicyclist on Alameda. Motorist drive-out at driveway. Five: bicyclist at intersection of Alameda and Rural (the edge of the project area); all involve the bicyclist in a crosswalk and turning motorists. four of the five faulted the bicyclist. FY 2020-21 Streetscape is $465K Transpo Tax + $1,584 CMAQ (federal Congestion Mitig Air Quality or somesuch). FY 2021-22 associated with the bridge itself $503K Transpo tax. I’d have to guess the actual bridge construction is very expensive and not included in these figures.